It was completely appropriate that the Cobblers’ latest league victory was secured with a headed goal by Ryan Cresswell. Not just because when Tranmere beat Northampton on December 28, the bruising Yorkshireman was a frustrated spectator, nursing the knee he injured in a FA Cup first-round replay six weeks previously. And not because on the occasion of that festive setback the team lost not one but two defenders to injury in the space of 10 first-half minutes, a weakness which was to stifle them throughout their desperately poor mid-season run. It was fitting for these reasons but also because, in these crucial games late in the season, the true colours of certain players are shown. 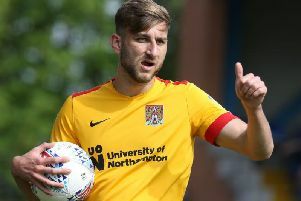 It can now be said with some certainty that in Cresswell, Northampton have a player who can be firmly relied upon when the stakes are growing gradually higher. He will admit that he should have scored at least one more goal, having headed wide when in good positions either side of the one attempt with which he did score. But what he does at the attacking end of the pitch tells only half of the story because he was also excellent as a defender, snaffling any loose ball which came his way and towering into header after header in a dominant display. This was exactly the type of performance for which he was bought - to lead from the back, make headers and interceptions, and to be a force in the other team’s penalty area. Good Cobblers teams of the past, and specifically those which have won promotion, have had defensive leaders of great repute, from Ian Sampson to Sean Dyche. Cresswell may not be classified with such players just yet but it is vital that teams chasing promotion have established and senior players in them to grind out results when the rest of the team are perhaps not as good as they can be. The win over Tranmere, which must have been so sweet for Chris Wilder considering the pain their victory caused him in December, started in a similar fashion to the other wins at Sixfields, with the home side attacking at pace right from the start of the game. In other matches, they have scored during such spells but did not against Rovers and so were forced to be more patient and resilient and to essentially wear down their opponents to the point of set-piece submission. There was still some attacking flair on display but it was brute force and sheer guts which won the day on this occasion, and Cresswell is a black belt in both such disciplines. It will concern Wilder that Ricky Holmes limped off with a nasty-looking injury because he has been a consistently high-quality player throughout his time at the club. But even that will do little to cool the glow of satisfaction he will take from looking at the league table this weekend - incredibly, inexplicably and perhaps unbelievably, the Cobblers are just three points off the top seven. The gap could, and really should, be wiped out altogether by full-time of Tuesday night’s game against Carlisle United at Sixfields. With key players excelling as the pressure builds, anything could happen now.